Sterling’s vitrified bonded general purpose grinding wheels for use on bench, floor stand and pedestal grinders are most eoonomic and efficient in grinding of all steels. These wheels are made of specially processed Brown Aluminium Oxide (A) and Silicon Carbide (Green & Black) Abrasives that give rapid grinding action, cooler cutting and excellent finish. 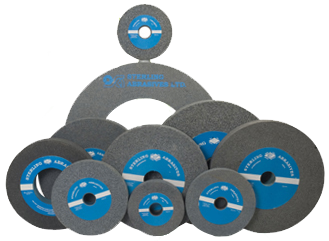 The self-dressing property of these abrasives results in higher productivity of the wheels.